Aja is one of the pioneers of performance poetry in his country Barbados, and is a leading exponent of the artform in the Caribbean. However, it was in 1989 with the publication of a collection of poems entitled "Rhythm & Roots" that Aja embarked on a career in performance poetry. Aja's initial involvement in the arts and music was in the field of music as a trombonist. However, his development as a poet soon took precedent, and in 1990 he took the literary artform to another level in Barbados. He incorporated full musical accompaniment in his poetry presentations, and recorded his first album. At a media briefing yesterday, AJA (right) said he is committed to making a difference in the world today in helping to eradicate poverty. At left is Aja’s public relations manager Anjie Allison. The Caribbean Broadcasting Corporation (CBC) will from next month be airing an international documentary on the tremendous works of Aja’s humanitarian tours world-wide. Programme manager for CBC Thom Cross said that Aja’s programme will be of significance since the Corporation will take his vision regionally by sharing it with stations across the region and further afield. Aja has recently returned from Sierre Leone where he supervised the arrival of thousands of boxes of food items and clothing that were donated from Corporate Barbados and the general public to children living with HIV/AIDS and impoverished persons in that country. At the official launch of his CD ‘Deception’ at the National HIV/AIDS Commission yesterday, Cross said that Aja is committed to making a difference in the world today, and that everyone should throw his or her support behind him in the remarkable cause that he has undertaken. According to Cross, “Aja has a particular social vision of the world that we want to capture and we are doing it through a series of poetry programmes that he will produce and they would be played from September through December”. Noting that the international media has been attracted to Aja’s work, Cross said CBC is also proud to have his voice and vision as part of the Corporation’s new programming schedule. However, Aja said that BBC has aired a ten-minute interview with him last December on his international campaign against war and poverty which had started in November 2003. He has secured an international distribution contract with world renowned record company Jetstar Phonographics Ltd. and his new CD ‘Deception’, which was redesigned and repackaged for the international market was launched in London on July 15th, 2004 at the Barbados’ Embassy. Aja’s International Public Relations Manager Angie Allison said that his PR campaign for the United Kingdom will introduce him to the UK public in its first phase and establish him as one of the world’s most influential humanitarian in the second phase. She added that the campaign will move Aja to a higher level and will commence September 1st, 2004. Aja, however, noted that it is unfortunate that so many children are suffering because of the inefficiencies and mistakes of adults and he feels that those children are not being properly protected. He added, “I hope that through the CD ‘Deception’ and the work that I am doing that the message would get across since I am just climbing a mountain as a poet who is trying to achieve the impossible”. Aja leaves for South Africa today for his next international performance at the Standard Bank/Joy Of Jazz-Jo’ Burg International Festival where he will be appearing on the same stage as international jazz musician Earl Klugh. Compliments of the Barbados Advocate click to read more. Aja’s poetry is social and cultural commentary and focuses on the plight of Third World peoples and the downpressed. It goes straight to the heart of social, historical, economic and political problems, which confront African peoples and the world in general. He has been Barbados’ Poet of the Year from 1991 and the Author of the Year in 1992. In 1993 Aja was also nominated for Barbados Entertainer of the Year. During that year he produced two records, a cassette 45 in June, and an LP/cassette in November entitled "Conscious." Aja appears on major musical productions in Barbados, transcending the perimeters of poetry. On June 12th, 1993, he became the first poet in Barbados and the third in the Caribbean to be featured in a calypso tent. He has performed throughout the Caribbean, as well as in the USA and Canada. In 1994, Aja released his second album entitled "Conscious". By then he was not only seen as a performance poet, but also as a dynamic entertainer. 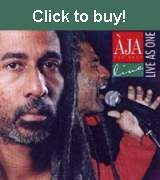 In 1998, Aja teamed up with Barbados' premier contemporary jazz band Jamari. The band members are Andre Daniel, keyboards; Ricky Aimey, bass; and James Lovell, drums and percussion. The Aja/Jamari partnership has created a fusion of Caribbean rhythms with Black American music - blues, jazz and funk. Aja's poetry goes straight to the heart of social, historical, economic and political problems, which confront African peoples and the world in general. Jamari Jazz Band - Keyboards, bass and drums Jamari: Ricky Aimey, bass; Andre Daniel, keyboards and James Lovell, drums and percussion.